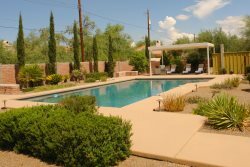 This comfortable home is located on the golf course at El Dorado C.C. The North facing windows and patio offer golf course and mountain views. This is a very spacious property with three bedrooms and 2 baths. There is a fully stocked kitchen with separate dining room and breakfast nook. The Great Room has large picture windows and a cozy fireplace for cool winter evenings. This is an older property, but clean and comfortable and in a great location making it an excellent value for the budget conscious shopper who still wants the benefits of staying in a centrally located golf course community.